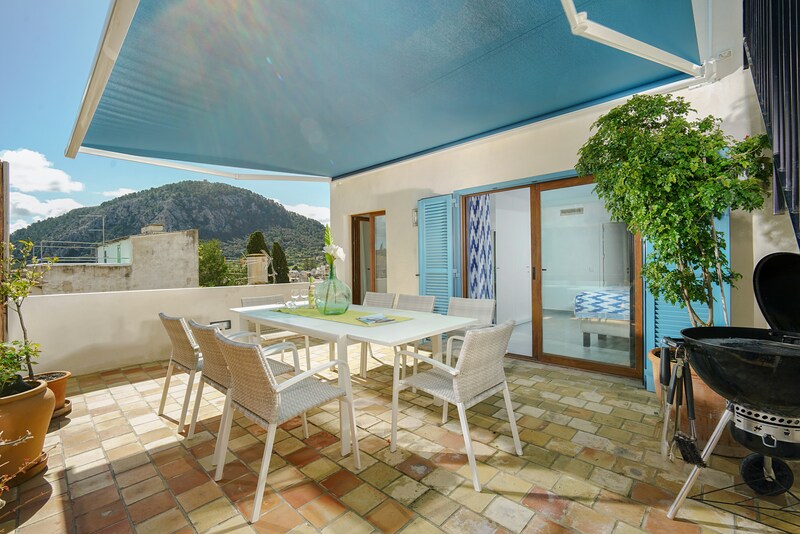 4 Bedroom, 3 Bathroom Town House with Mountain View, Air Conditioning, WiFi, Jacuzzi, Satellite TV, near Golf, Sleeps a maximum of 8 people. 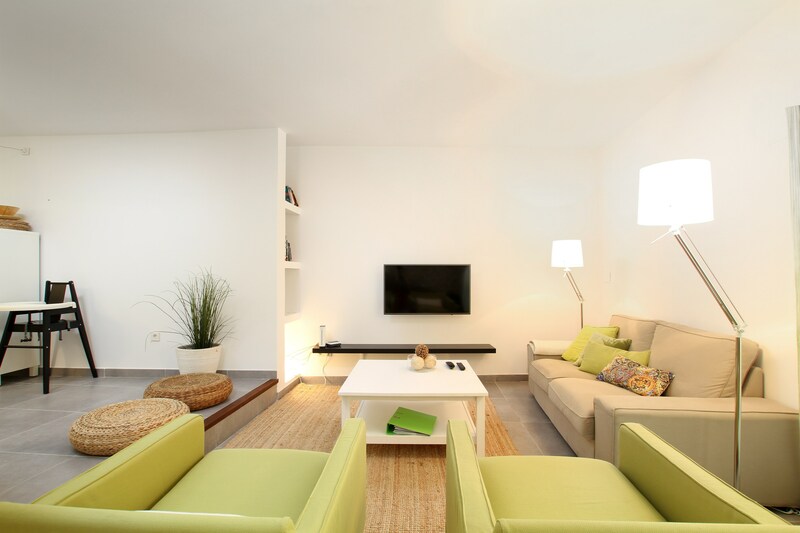 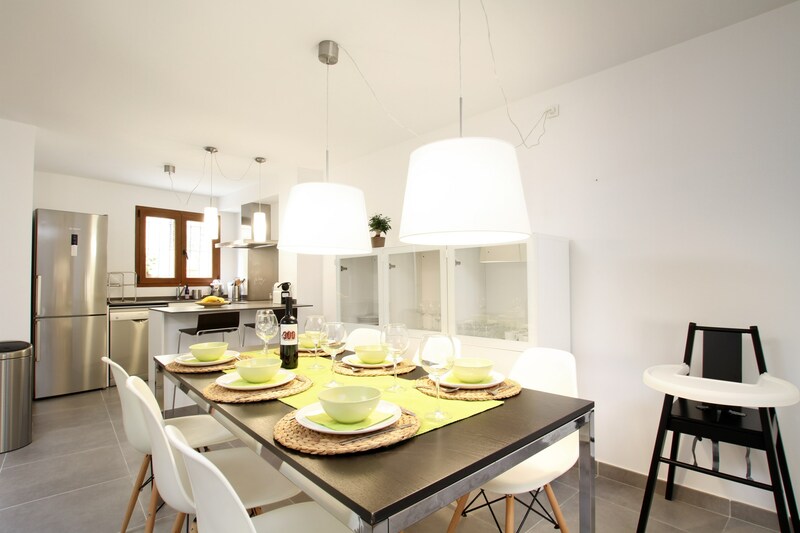 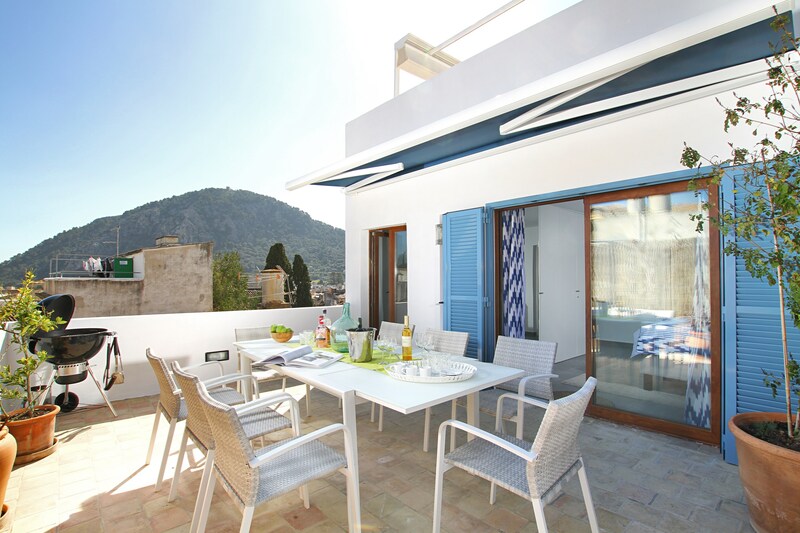 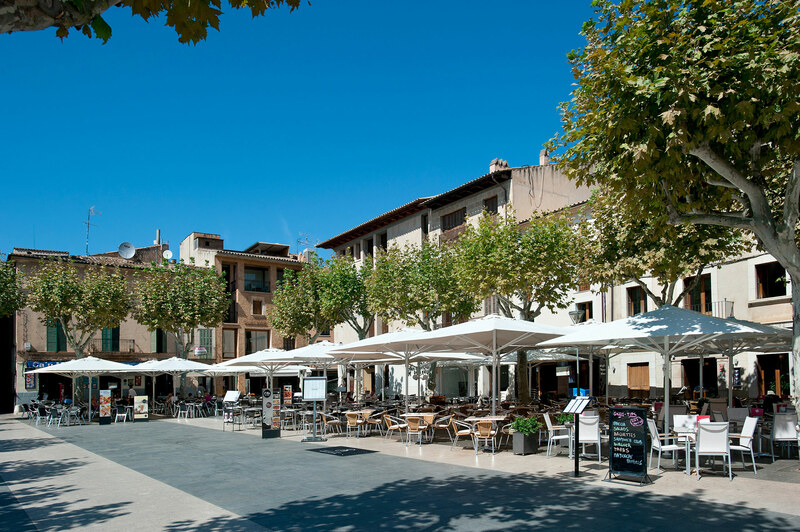 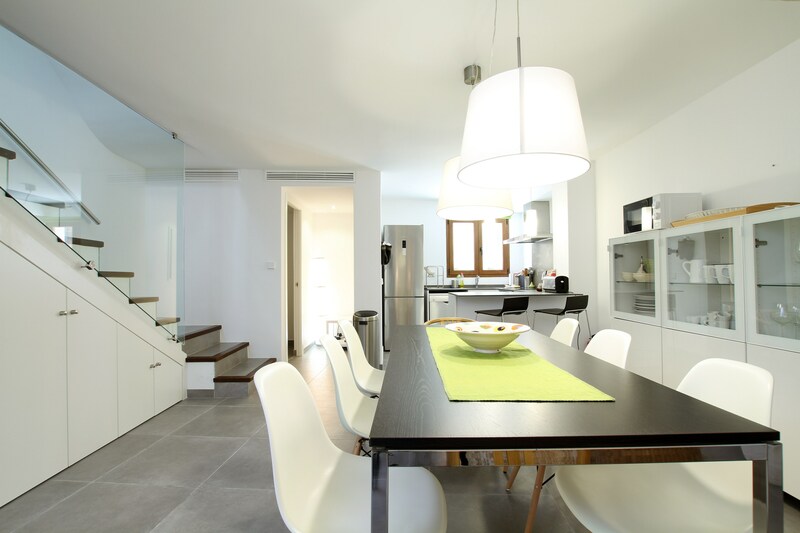 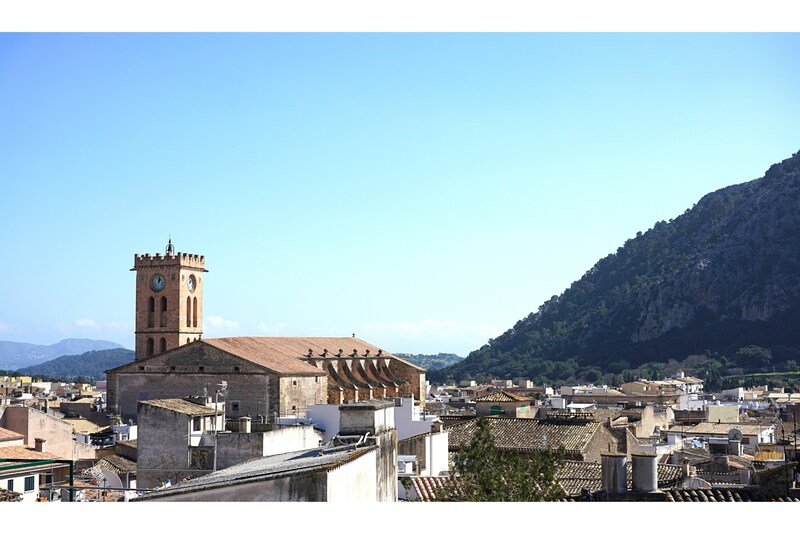 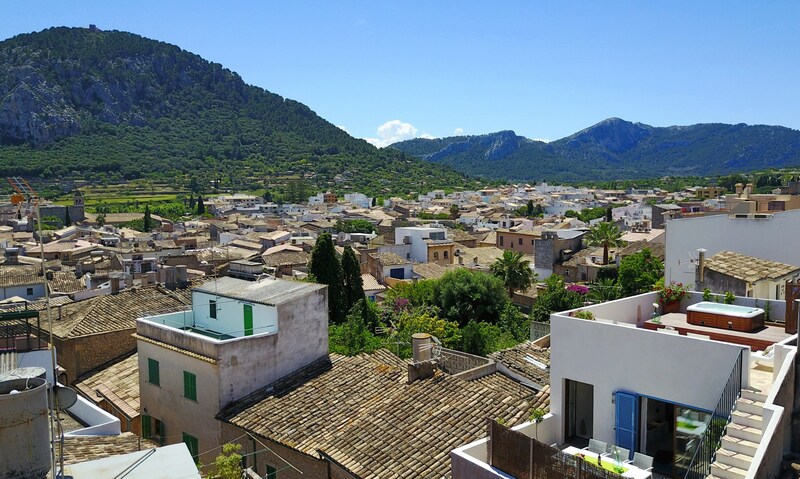 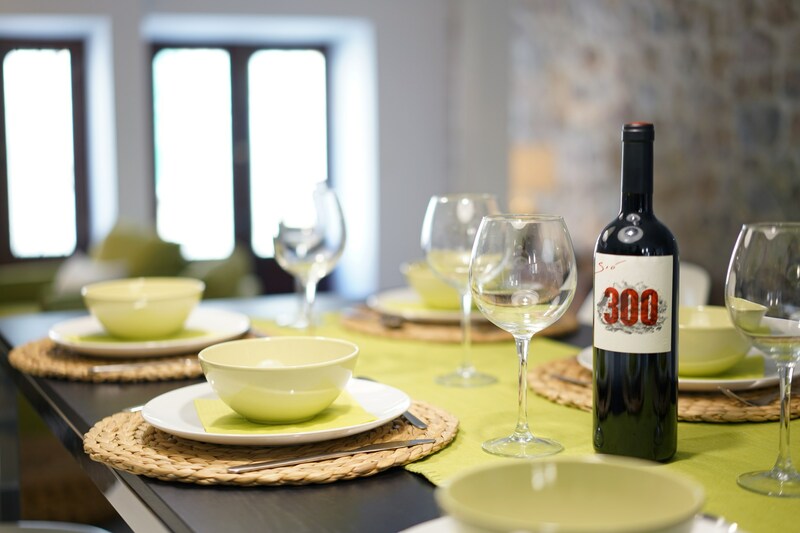 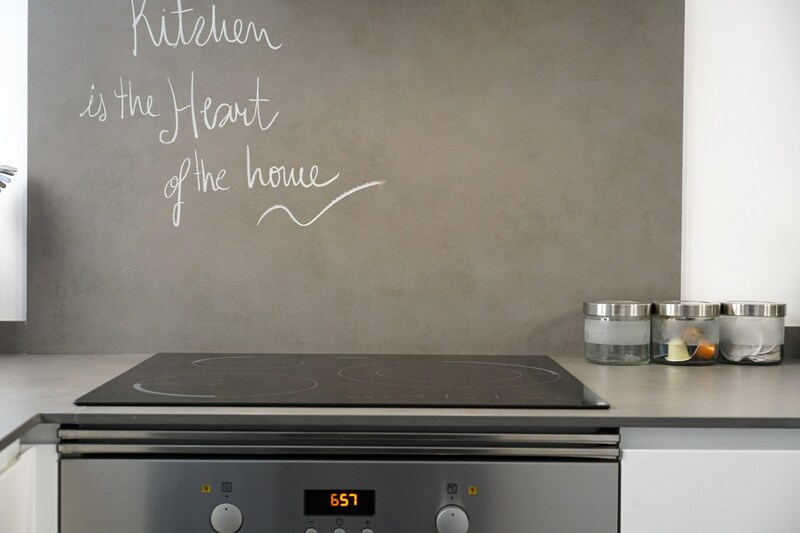 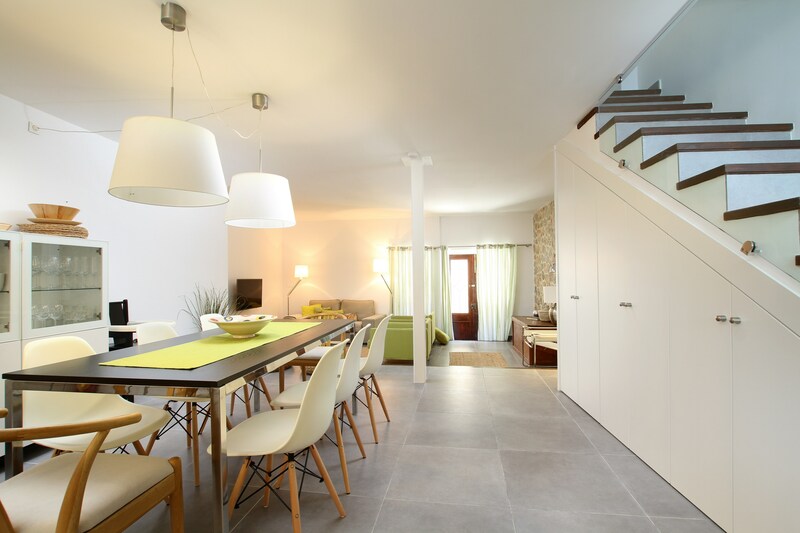 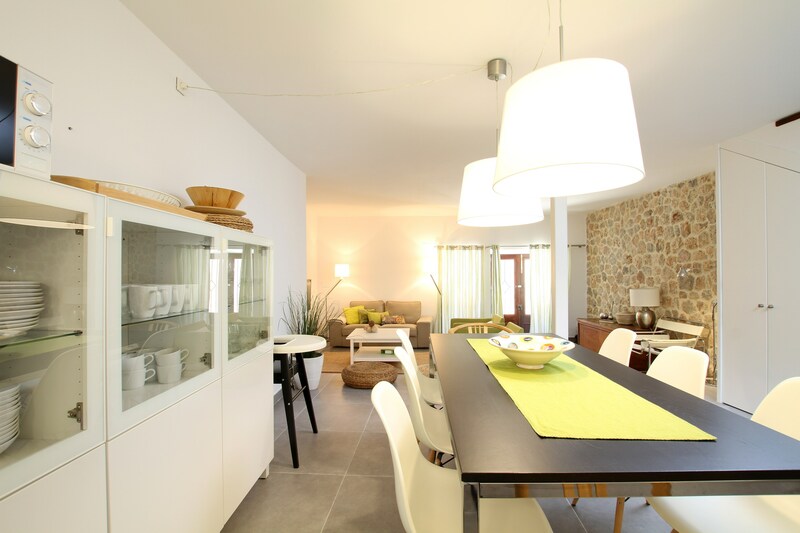 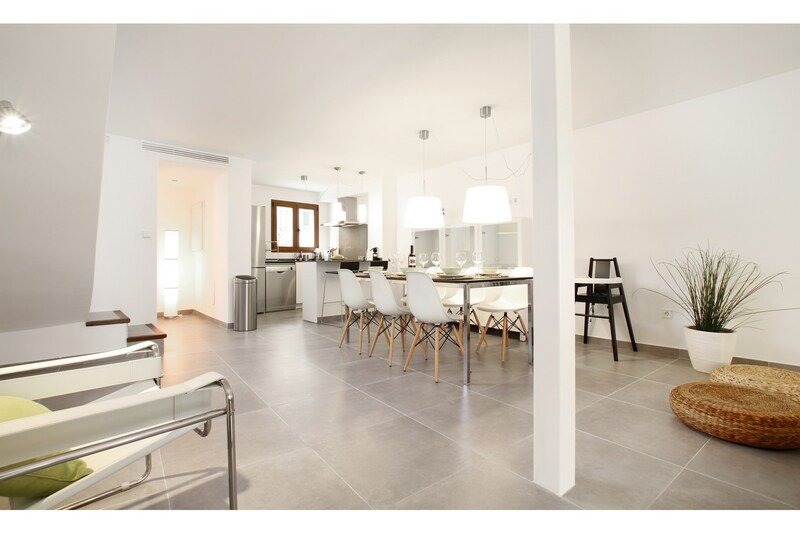 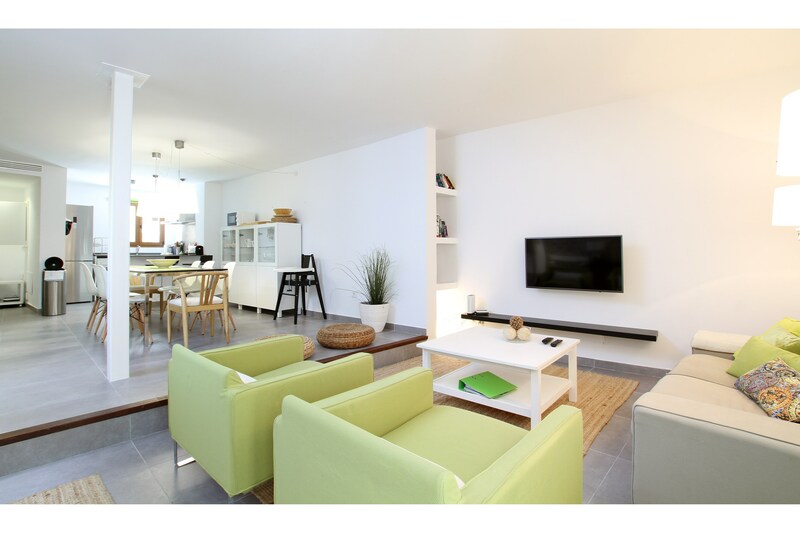 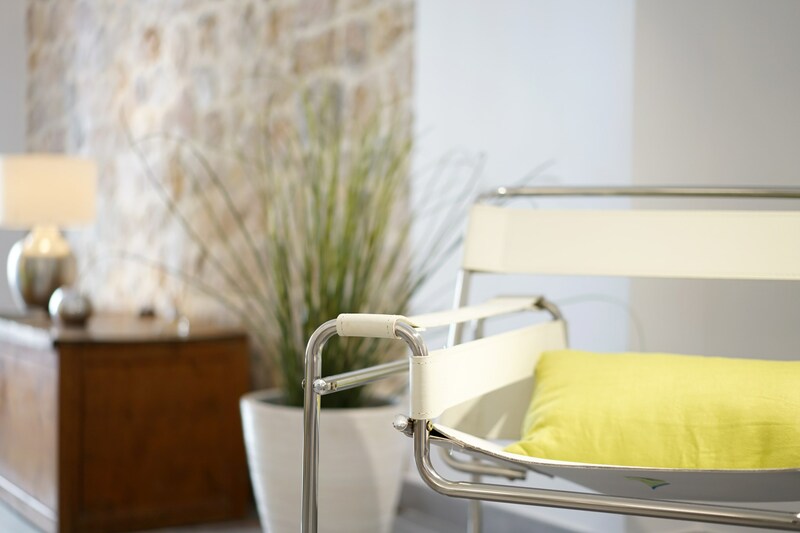 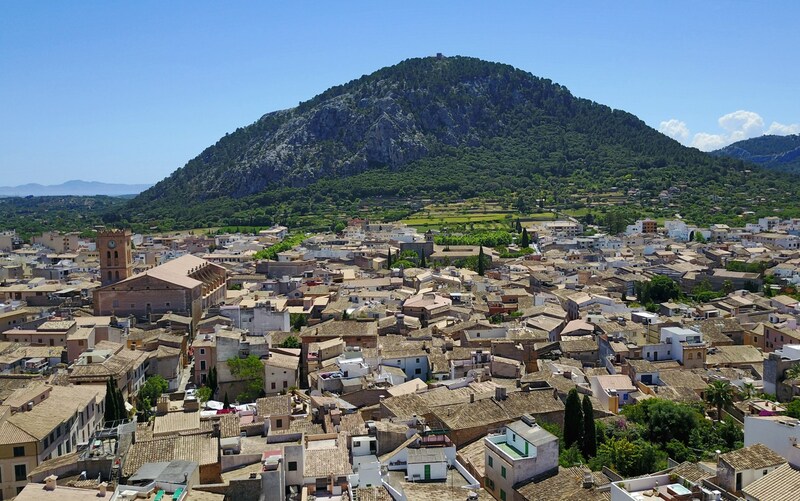 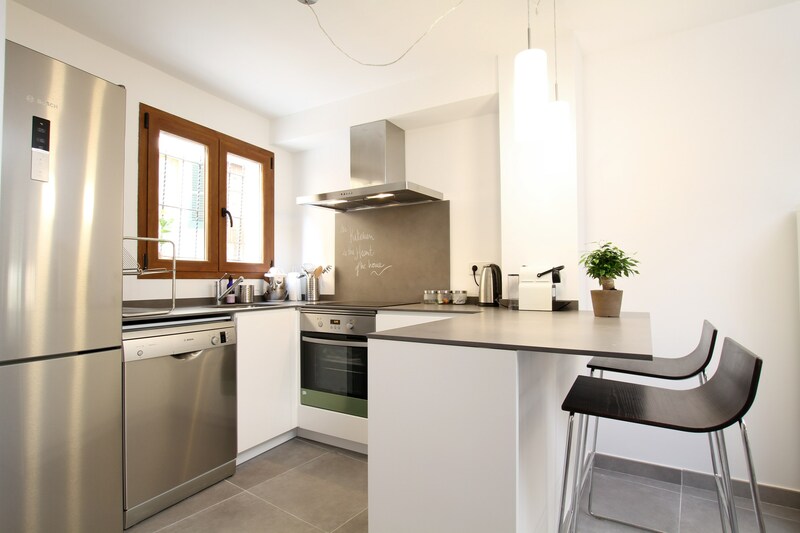 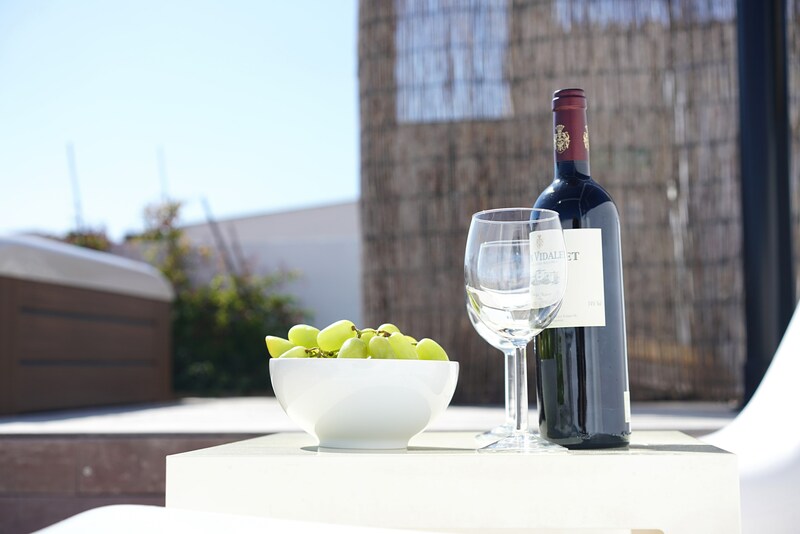 Casa Hill is a modern, recently refurbished townhouse, tucked away in a quiet hillside street just a few minutes from the main square of Pollensa. 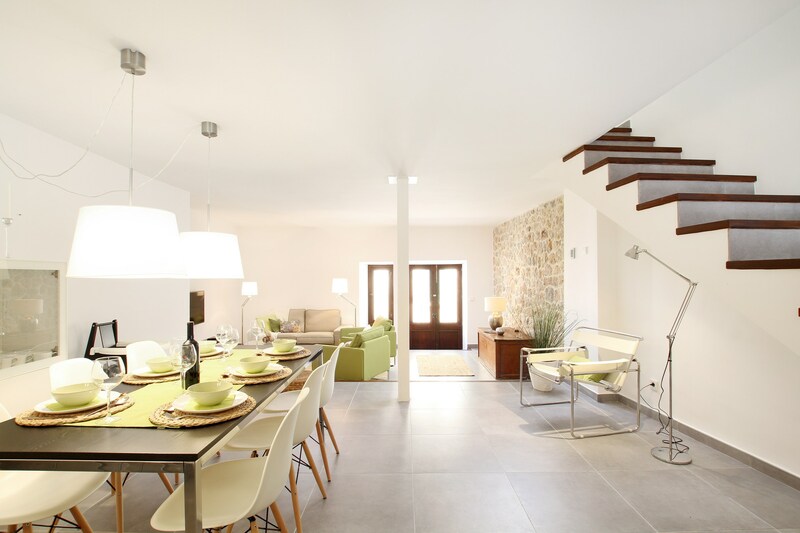 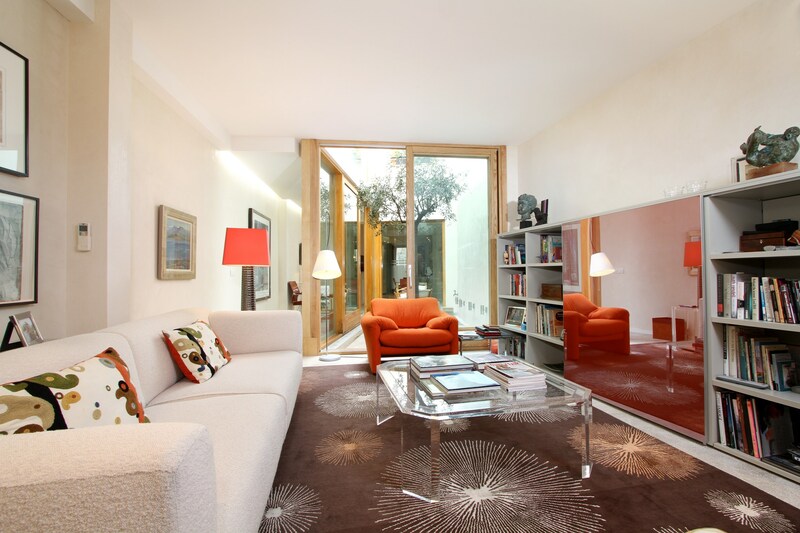 Dont be fooled by it`s humble facade - Casa Hill doesn`t look an inch out of place between it`s neighbours, but open the front door and you will be amazed by just how bright and spacious this designer abode is! 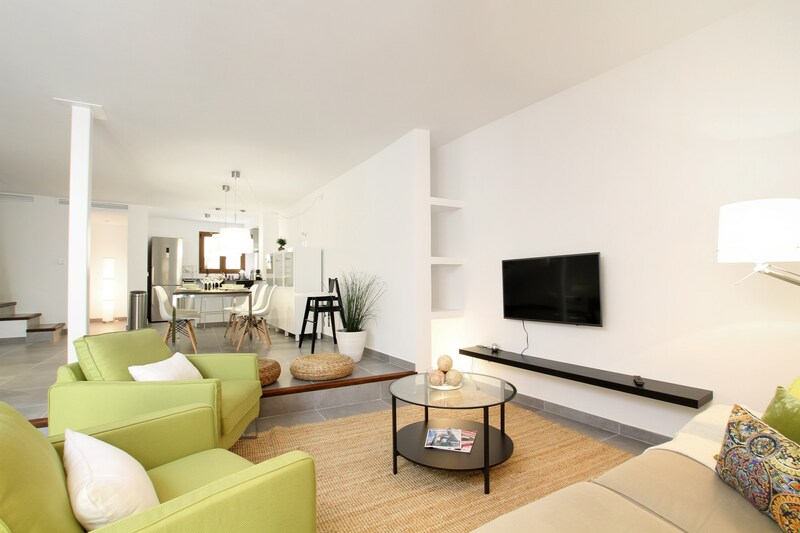 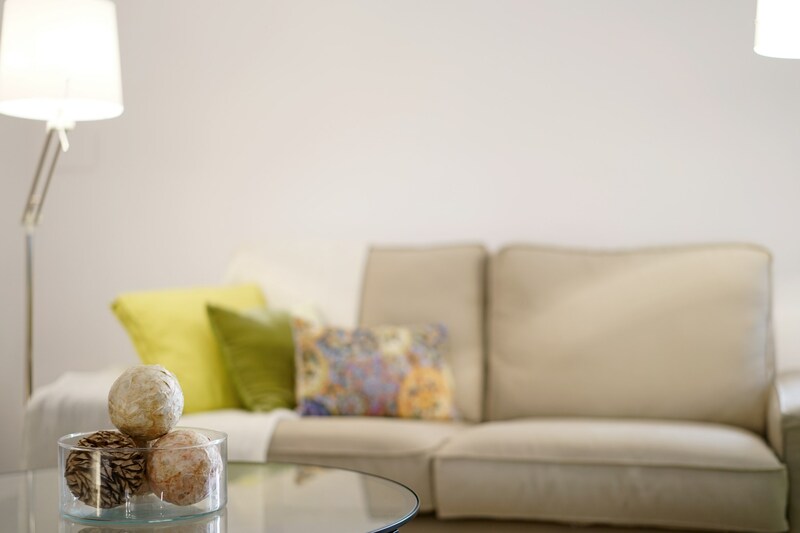 Effortlessly chic, Casa Hill opens up into a large open plan living space that incorporates a lounge with comfortable recliners and sofa, as well as a flatscreen TV with cable channels. 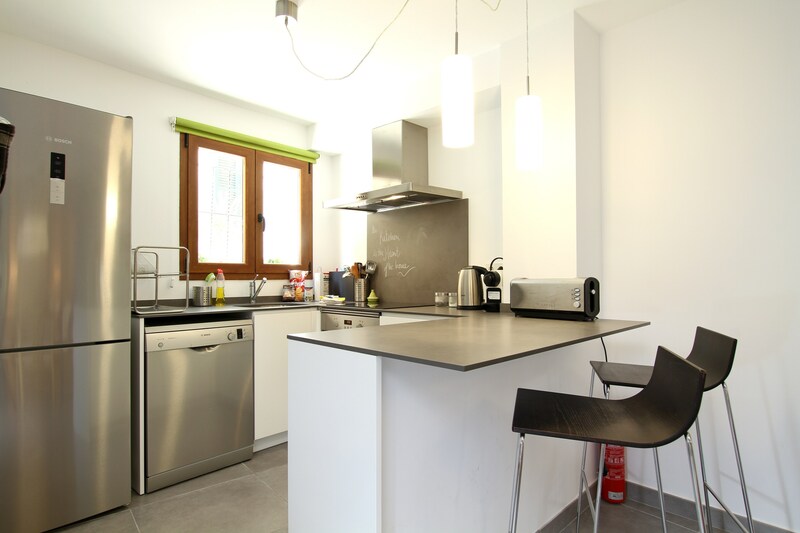 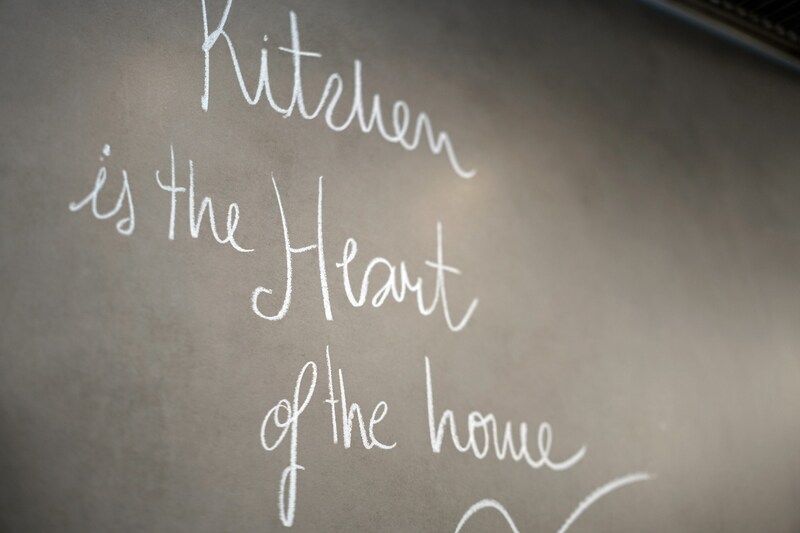 Head up a dividing step and there is the dining area and further on the compact yet comprehensive kitchen, which comes with an induction hob and electric oven, dishwasher, fridge/freezer and a Nespresso coffee machine, and it even has a breakfast bar with a pair of stools. 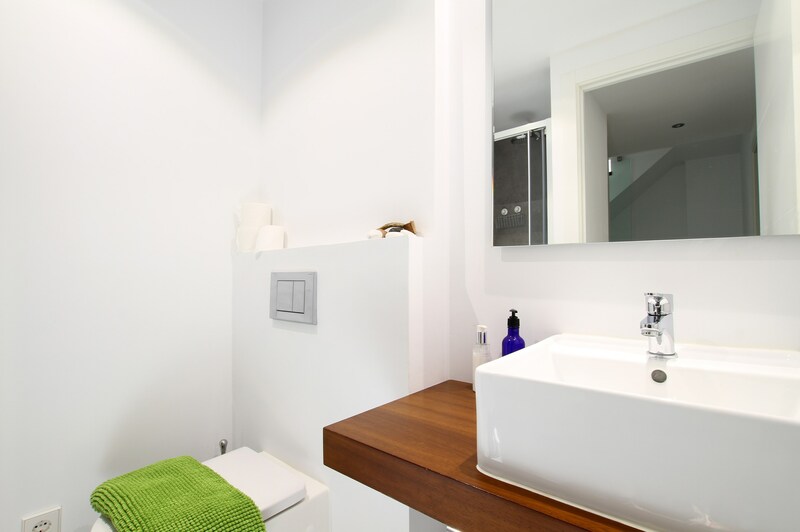 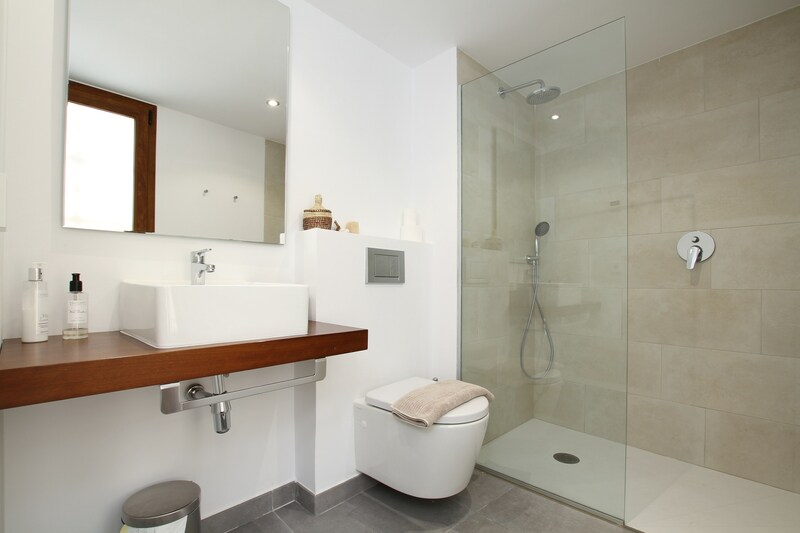 Downstairs at the end of the room you`ll also find a sleek WC. 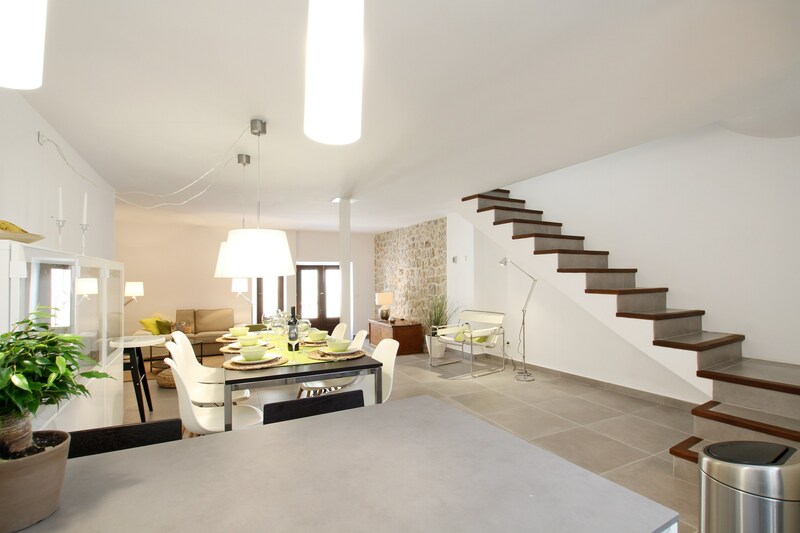 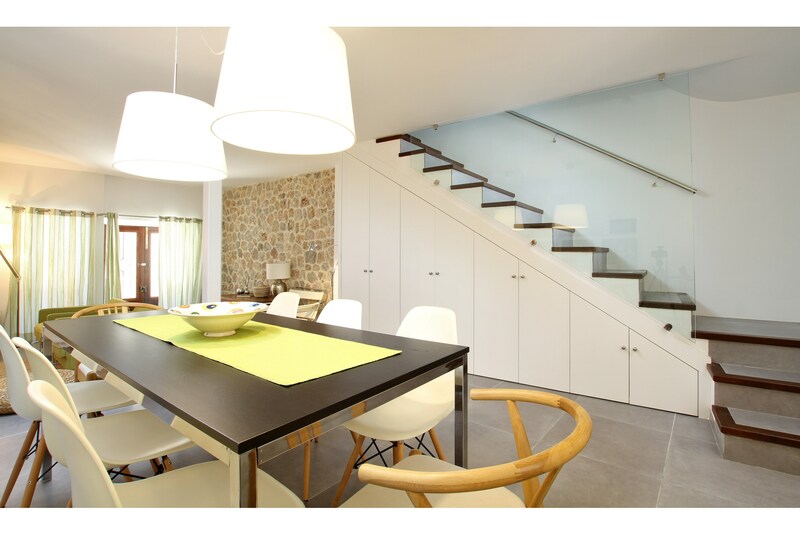 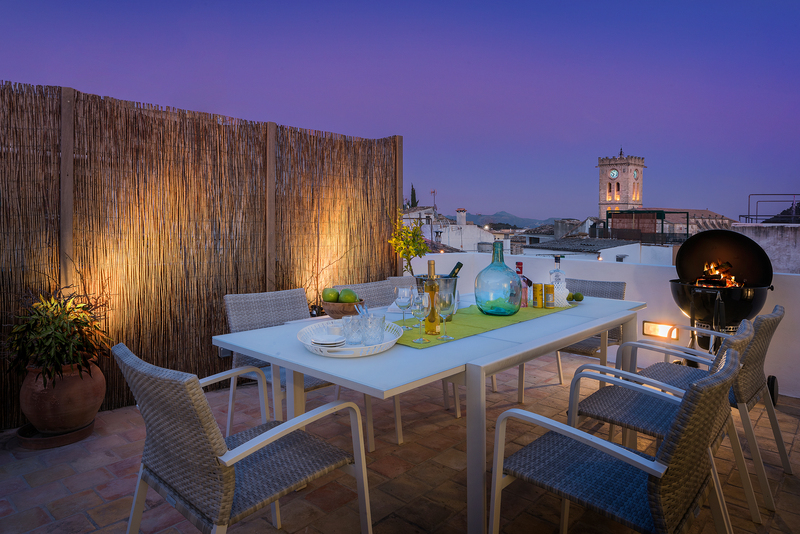 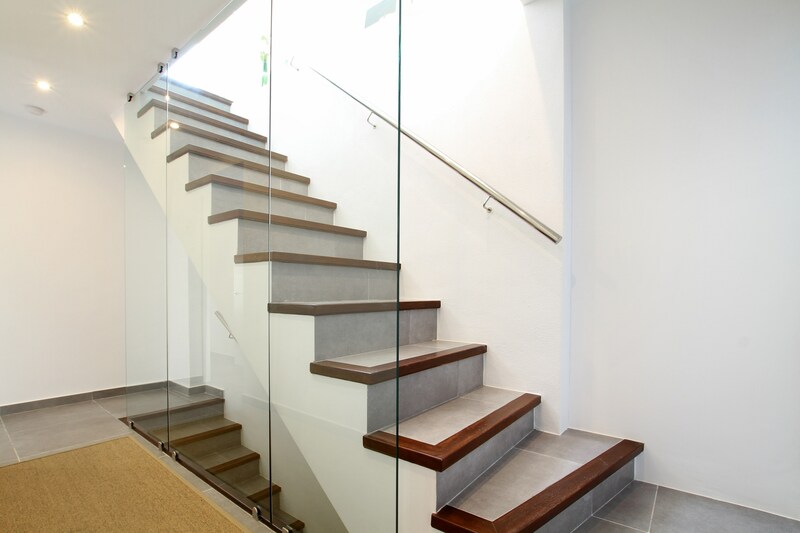 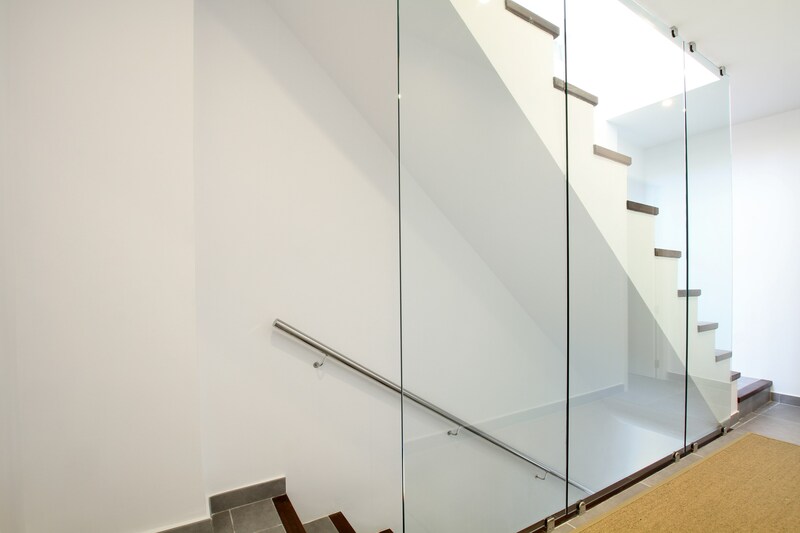 Head up the understated stair case and you`ll reach the first floor, which is home to three bedrooms - banisters are forgone in Casa Hill, and the owner has chosen fashionable glass panels to keep you on track after a glass of wine too many on the roof terrace! 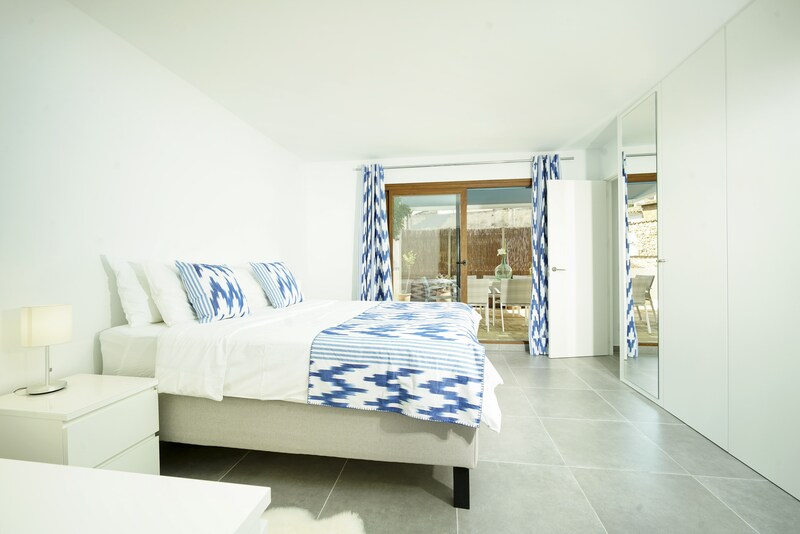 Two of the double bedrooms share a shower room on this floor, and come with wardrobe space. 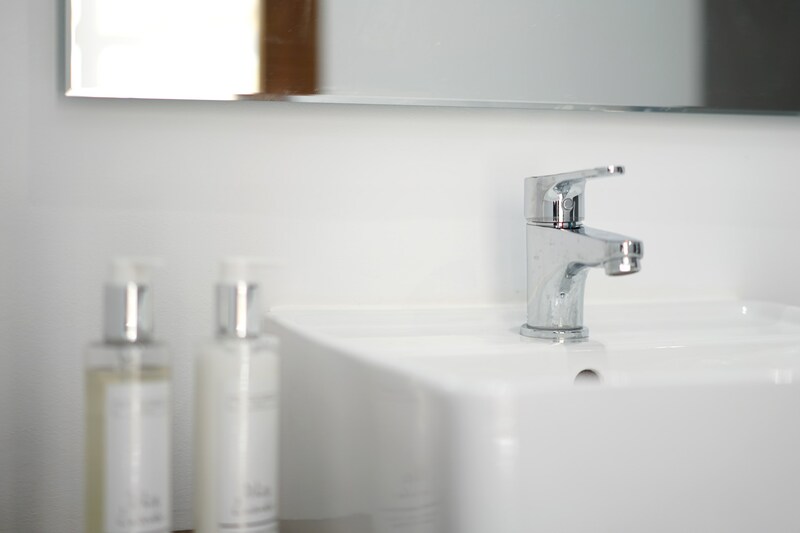 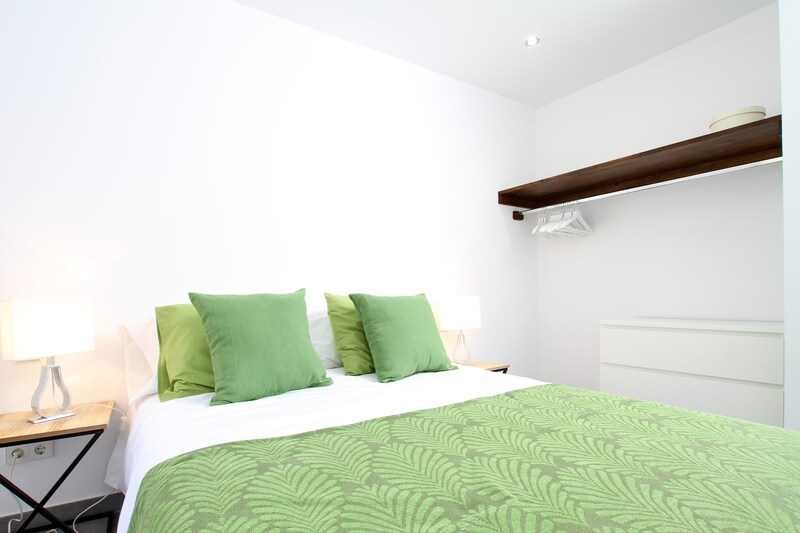 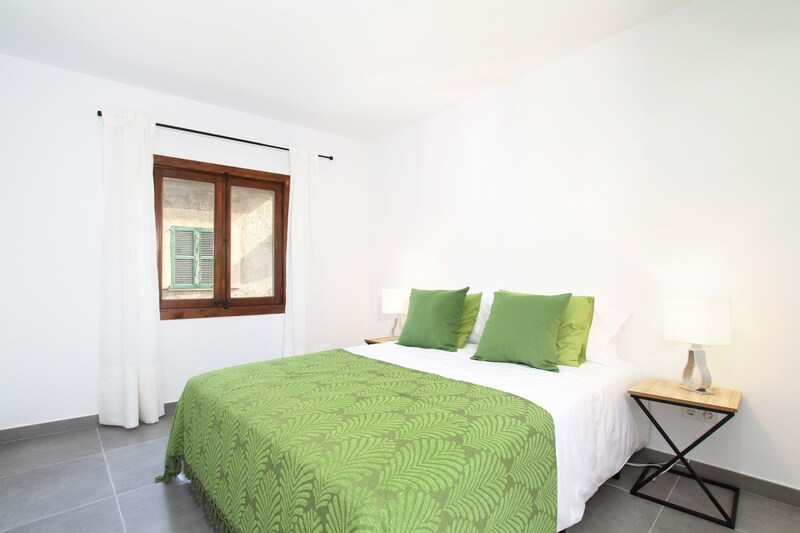 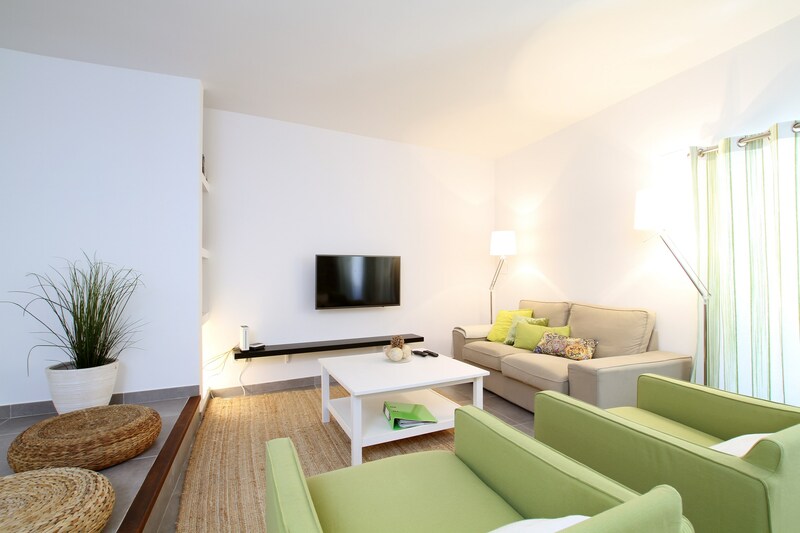 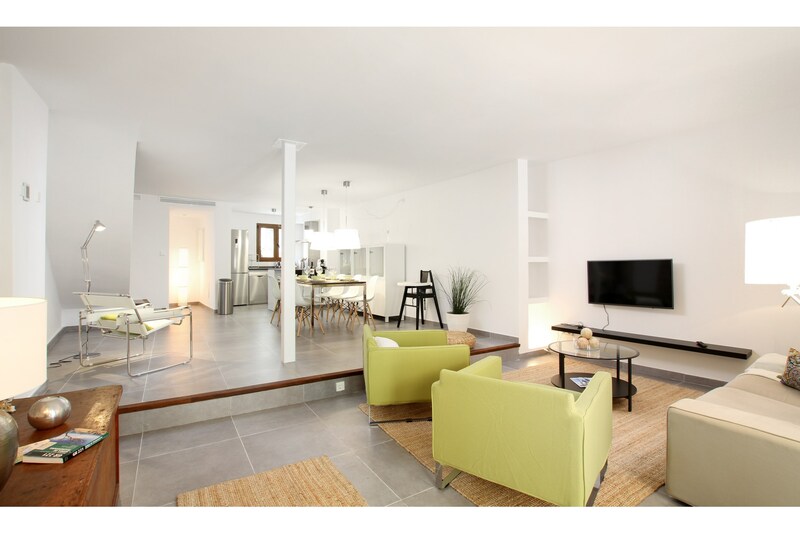 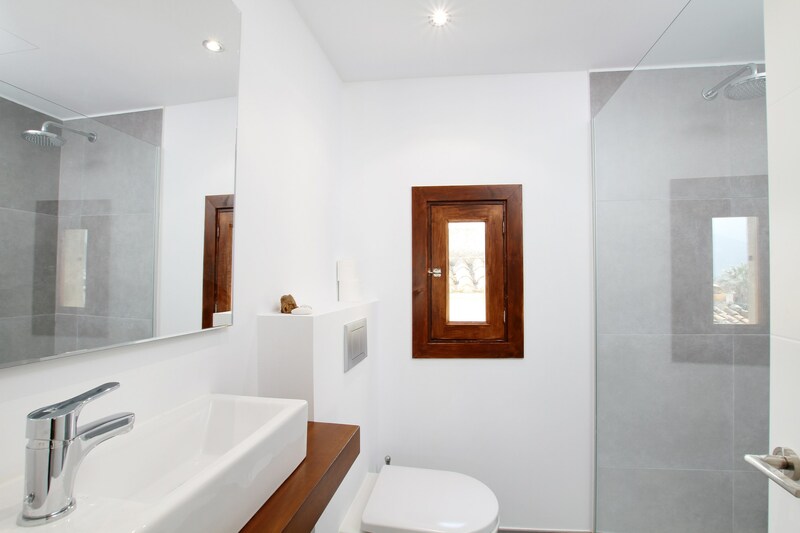 The third double bedroom is slightly larger and has it`s own en suite shower room. 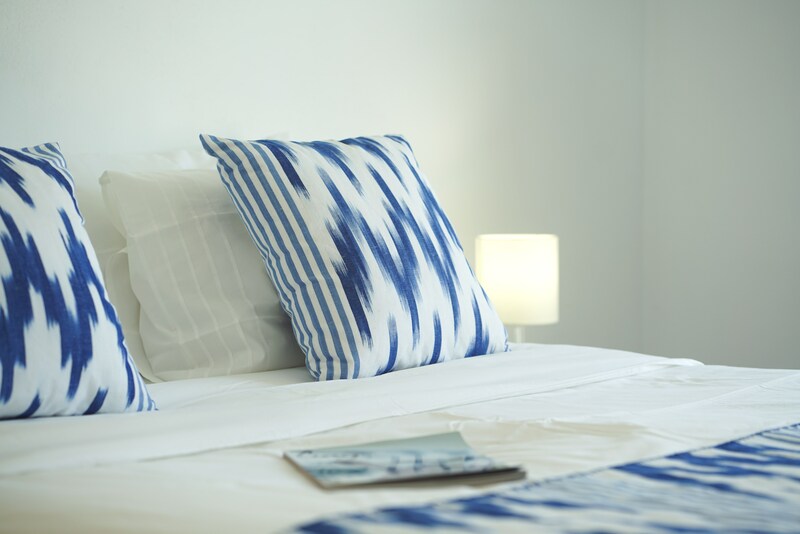 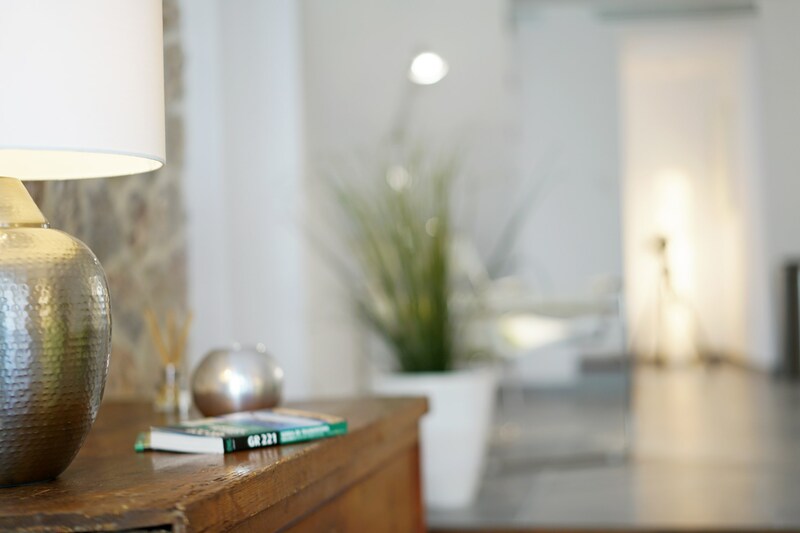 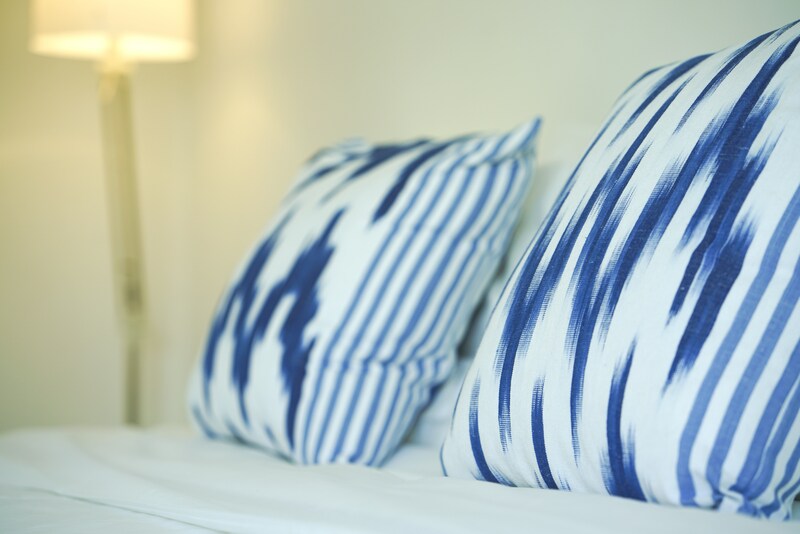 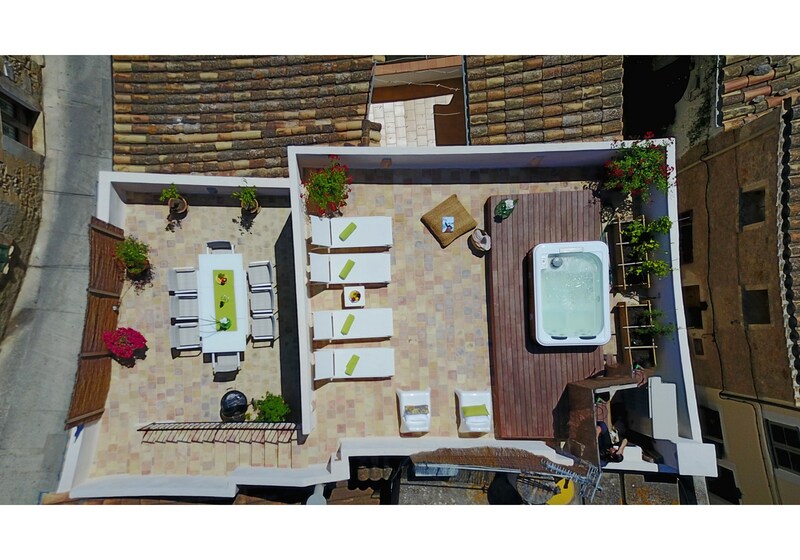 The third floor however, has been made into the master suite with its own en suite shower room and direct access to the terrace which enjoys morning and afternoon sun, and is furnished with outdoor chairs, a large table and local plants. 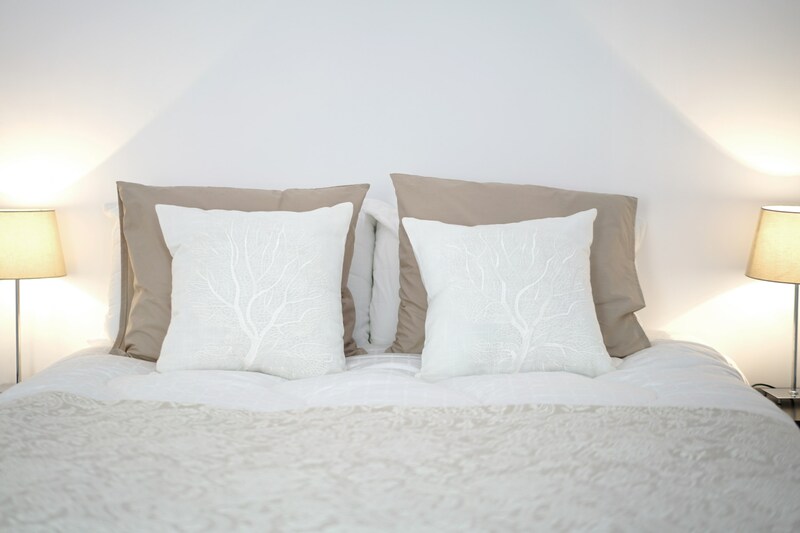 Please note that all twin bedrooms can be converted into doubles! 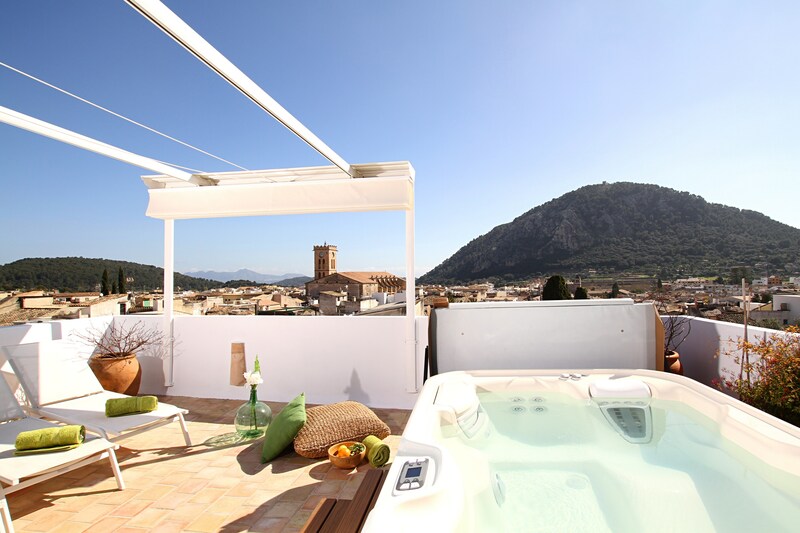 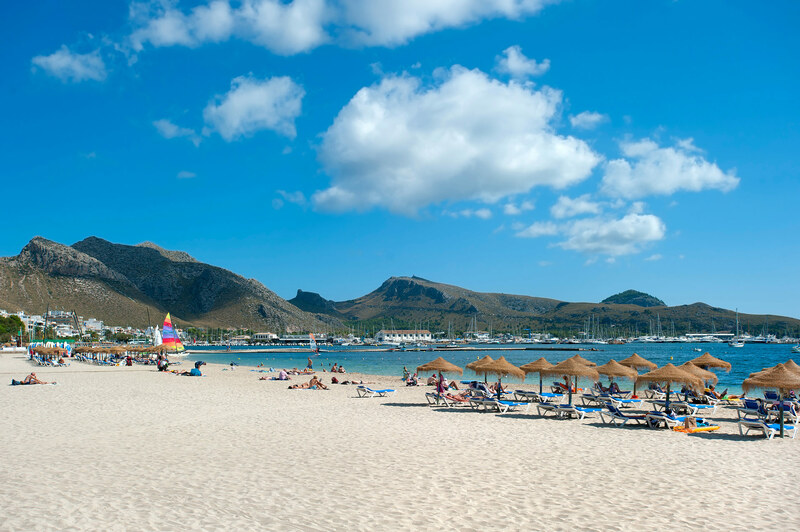 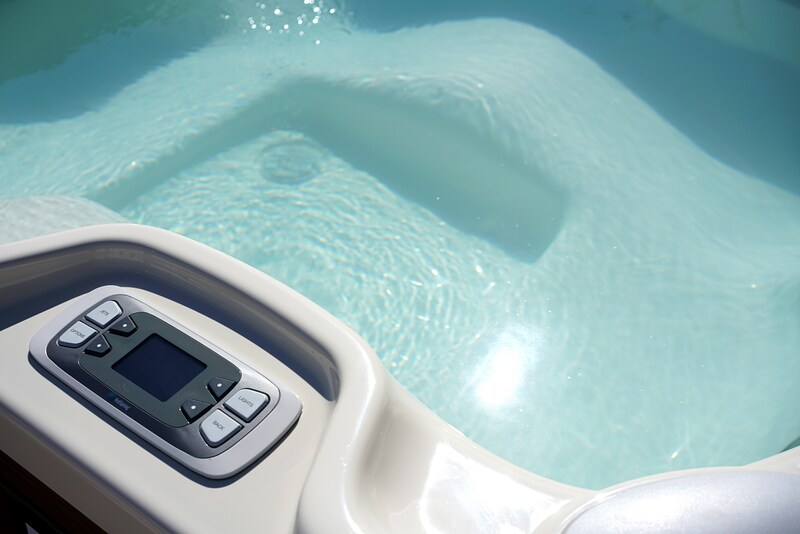 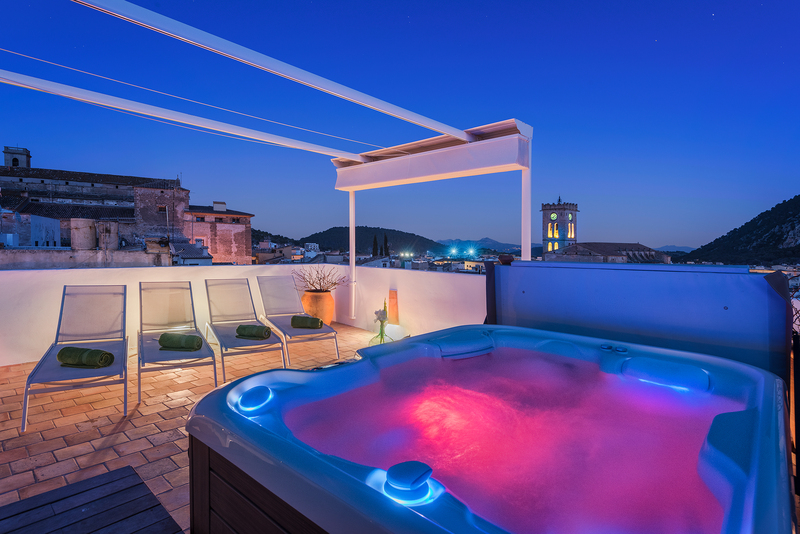 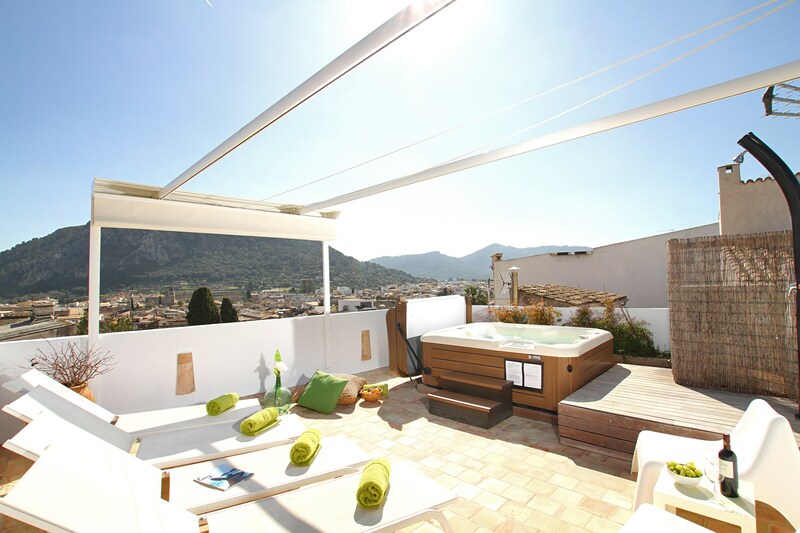 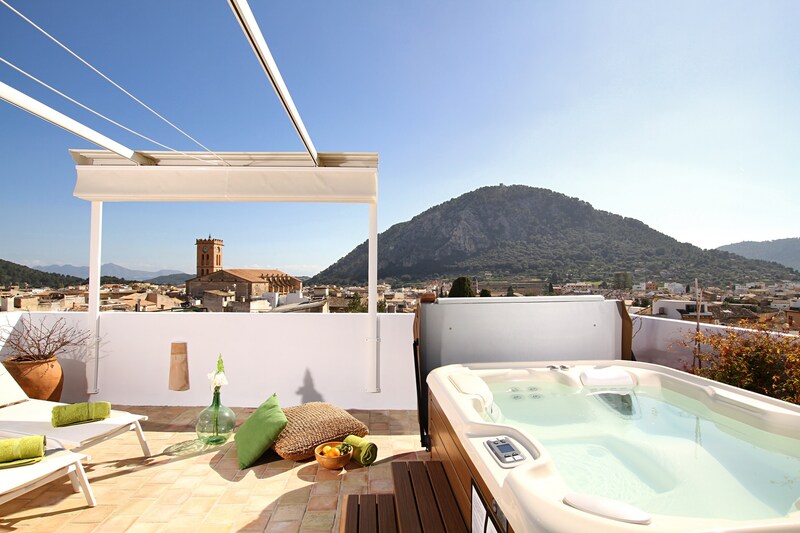 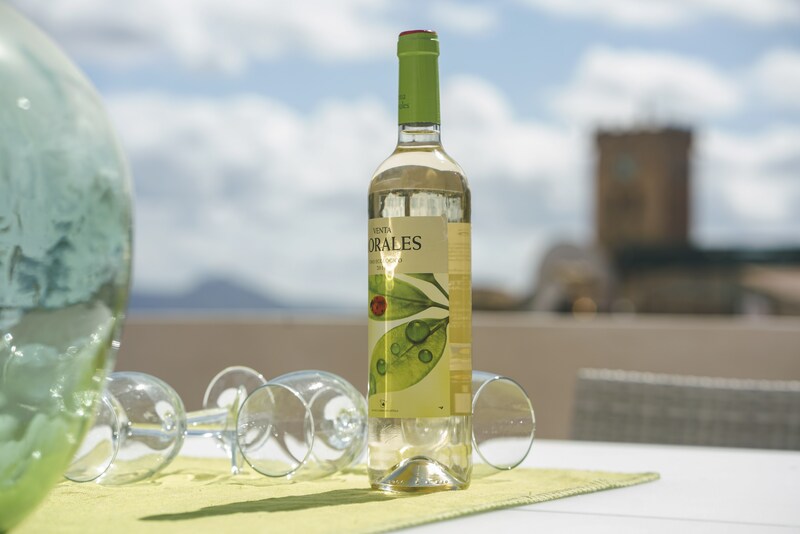 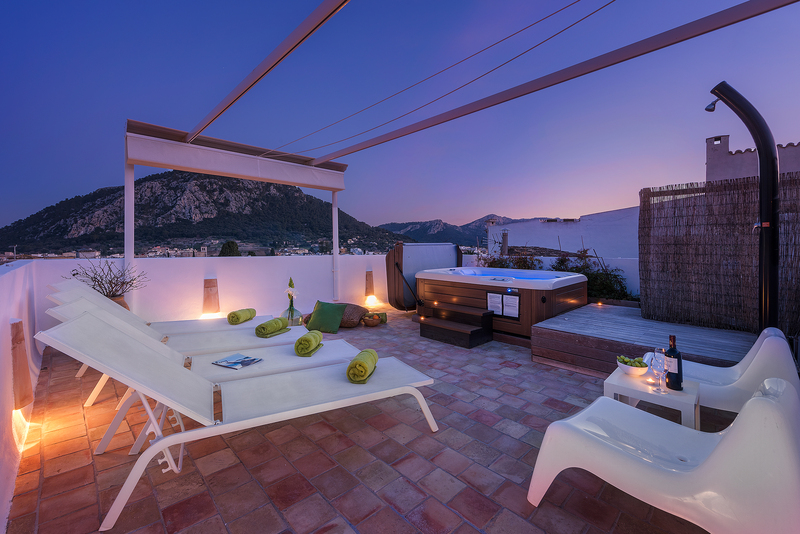 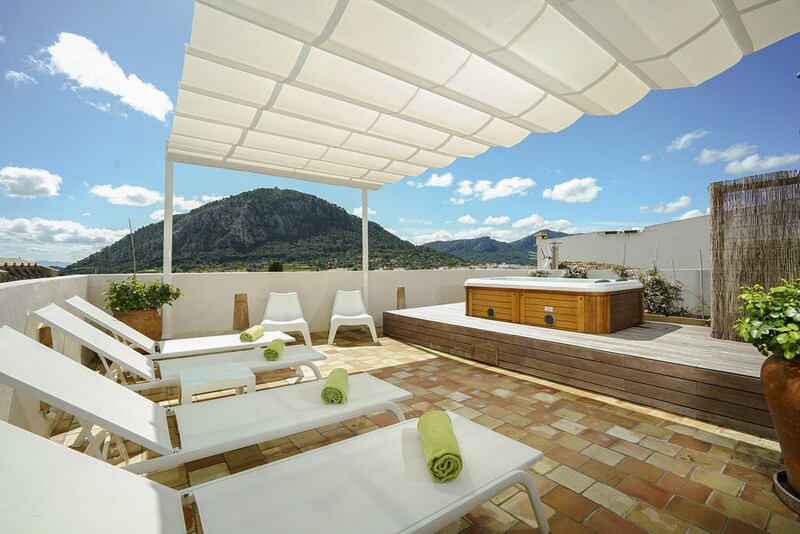 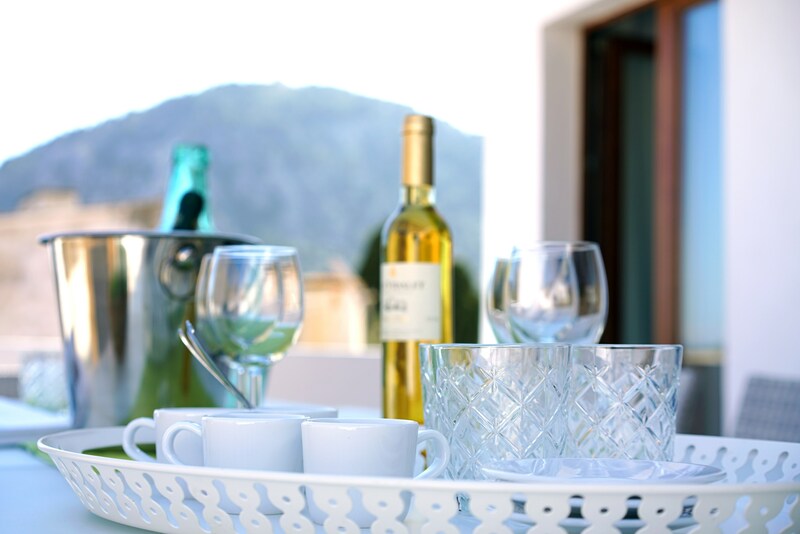 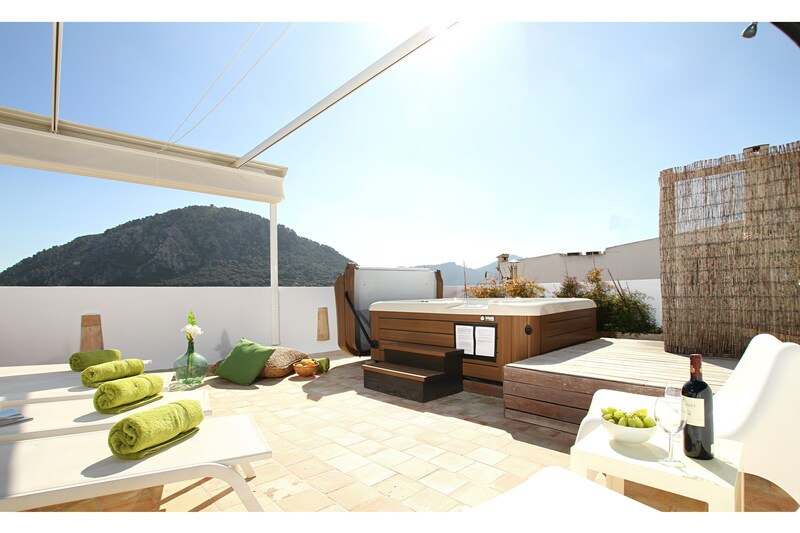 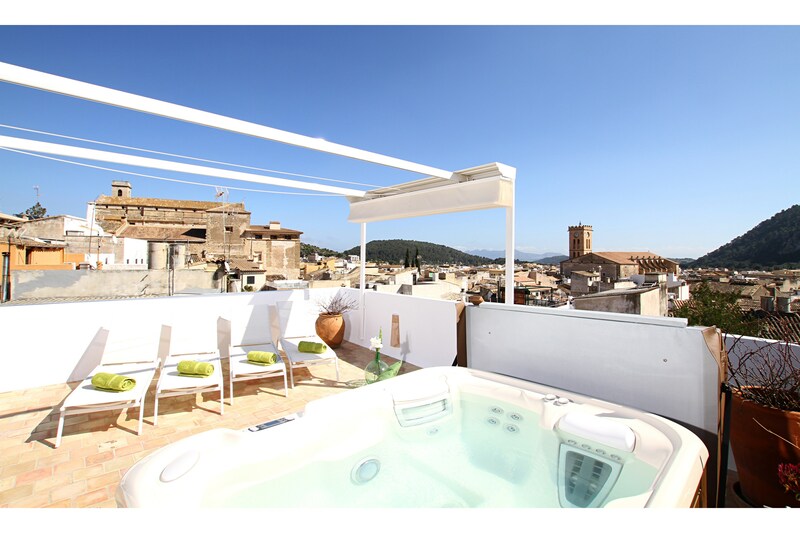 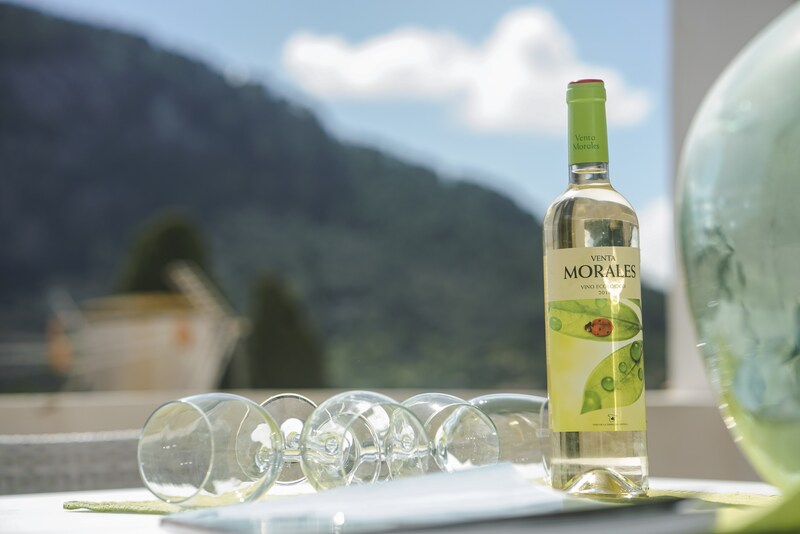 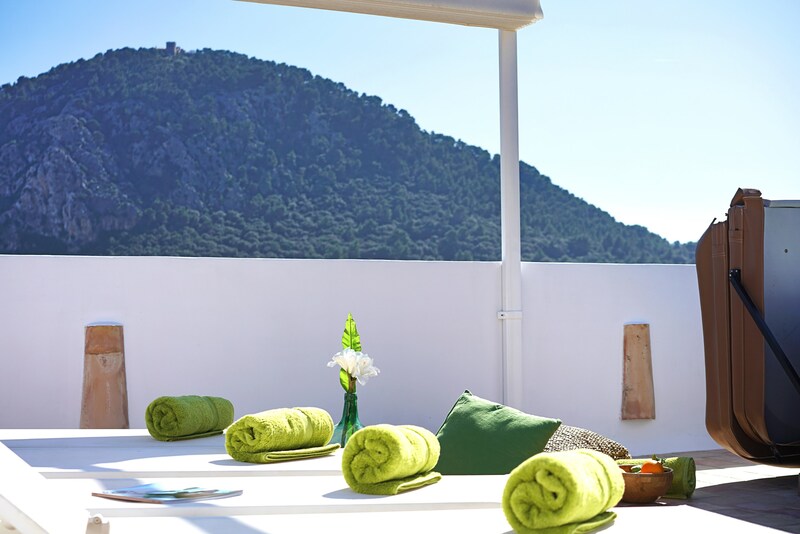 Follow the stairs up to the second level of the roof terrace and you`ll find a hot tub and stunning views over Pollensa and out to the Puig de Maria - there`s no place better to put your feet up after a long day at the beach! 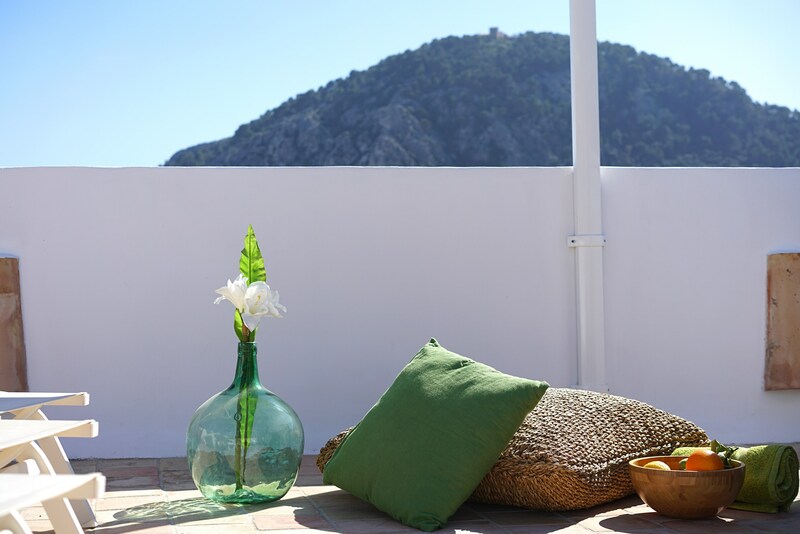 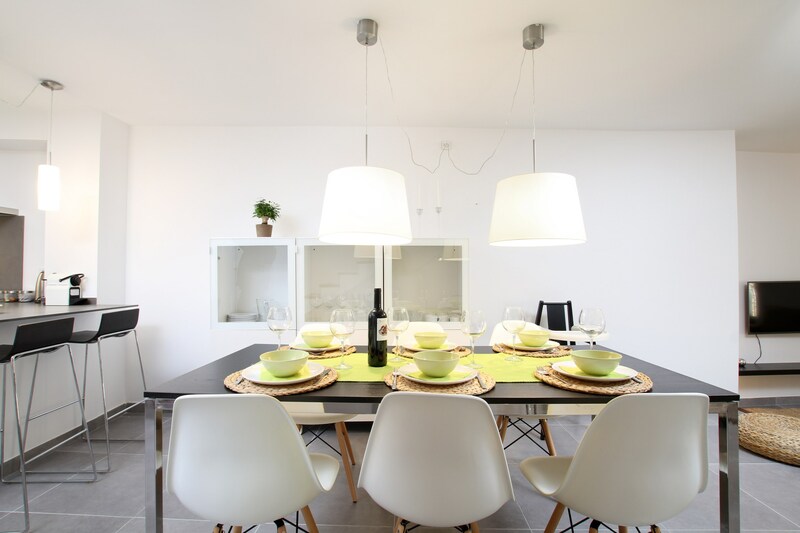 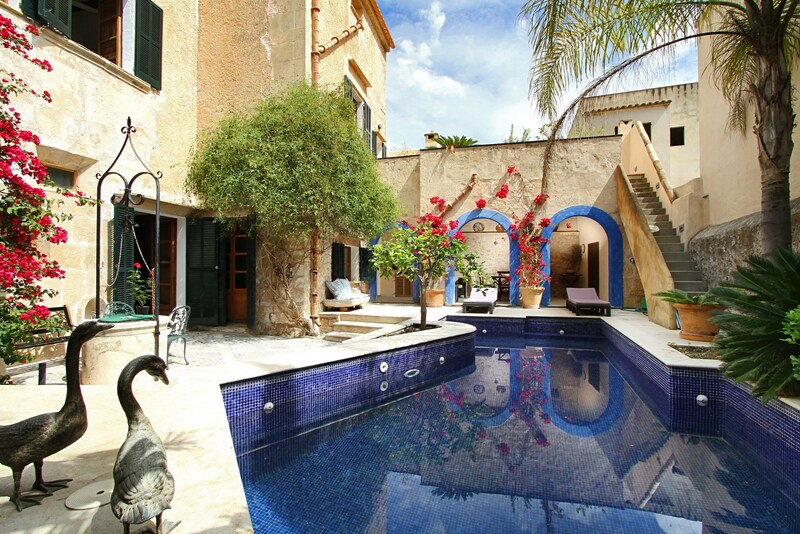 - Casa Hill can be rented for 5 days minimum stay outside of June to September.